We’ve been really excited about the most recent addition to our lineup, the Fountain Pen version of the legendary Caran D’Ache 849. 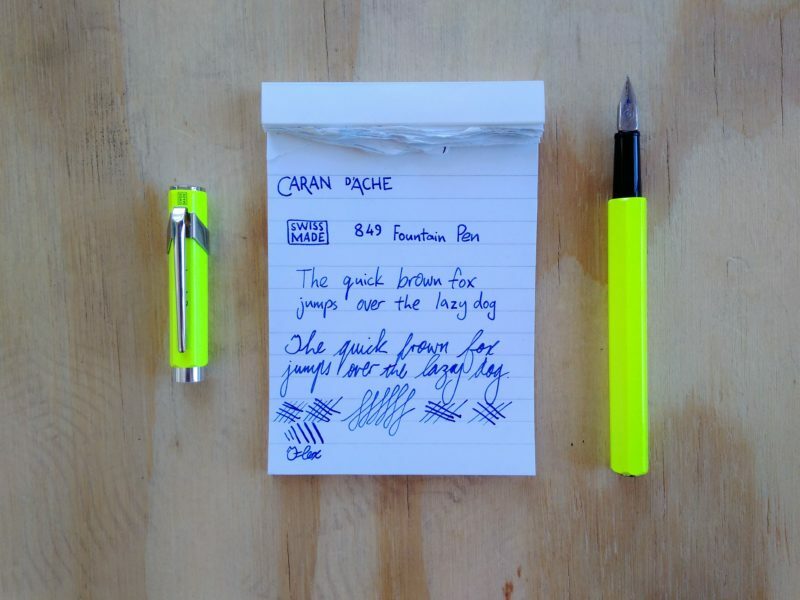 In order to fully appreciate this release, here’s a bit of history on Caran D’Ache and the 849. Caran d’Ache has been around since 1915, over 100 years ago! Since then, they’ve been a major player in the stationery world. Their stationery has even featured on Swiss postage stamps. They’re a company full of heritage, and the 849 is one of their most important designs. The 849 ballpen has really modern styling. It’s long, slim, and hexagonal, drawing inspiration from traditional wooden pencils. The 849 is extremely comfortable to hold, and it’s been released in a huge range of finishes. It’s a beautiful blend of elegance and fun. Hard to believe that the first 849 was released in 1969, and that the design remains basically unchanged since then. This ballpen has been a staple of their product line for almost 50 years, and now it’s finally available as a fountain pen. The Caran D’Ache 849 Fountain Pen is visually very similar to the ballpoint. It features the same angular clip and the same hexagonal cross-section. 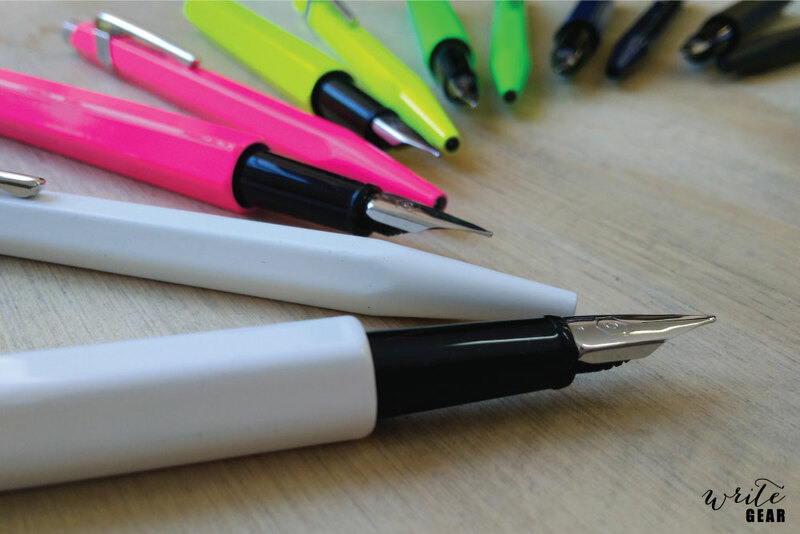 It is different though, in that it is slightly wider in diameter, and it features a cap that you can pull off, instead off using the click action of the ballpoint. The nib is almost triangular in shape, and features no breather hole. It is surprisingly soft, providing some unexpected line variation. 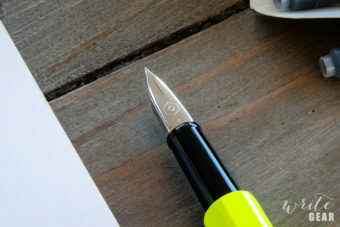 In terms of the writing experience this pen offers, it feels almost like a pencil – it’s extremely comfortable on the page, with a little bit of feedback, and a pleasant swishing sound. With the extremely clean aesthetic of this pen, you wouldn’t expect it to post at all, but it does so fantastically. The cap has in insert that fits into the body of the pen, and it fits into both sides of the pen the same way. Whichever side you have the cap on, it looks seamless. We’re happy to note that it’s also compatible with International Standard cartridges and converters. In fact, the cartridge in the barrel is Caran D’Ache Idyllic Blue. With an ink like that, there is no excuse not to get writing straight away. With neon finishes like Pink, Green, Yellow and Orange, you’ll have a hard time losing it. For a bit of a more distinguished look, you could also get it in White, Matte Black, or Matte Blue. We’re really happy to use these pens, and we’d love to hear your thoughts too. 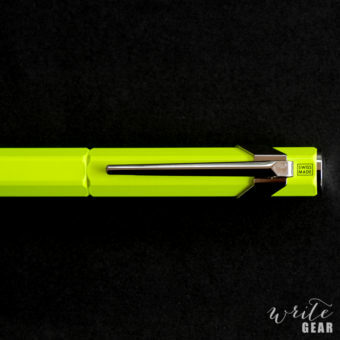 Got mine in White, but that neon yellow could have saved me from many boring afternoons at the office…These pens are extremely light, so great for longer writing sessions. 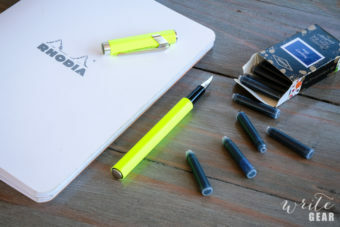 It handles lovely – I use it on cheap copy paper at work and on Rhodia pads. Slight feedback, but I find it quite thrilling. 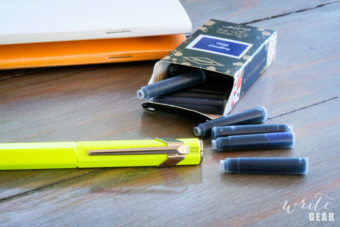 Can definitely vouch for ink compatibility: have tried Faber-Castell, Diamine and J. Herbin inks in mine – it produced pretty much the same line thickness, which I like in a pen.